March 6 may be National Oreo Day, but it's also National Frozen Food Day, something you probably have either never heard of or couldn't be forced to care about. Maybe not coincidentally, McDonald's made a big announcement about its Quarter Pounder on Tuesday. At some point this spring, all Quarter Pounders and Signature Crafted burgers will no longer contain frozen beef in the continental US. Whether or not that timing was intentional, it wasn't lost on Wendy's which wished the Golden Arches a very merry National Frozen Food Day. It wasn't enough to toss a burger burn at McDonald's. Wendy's made that tweet into a thread and highlighted all the burgers McDonald's will still make from frozen beef patties. 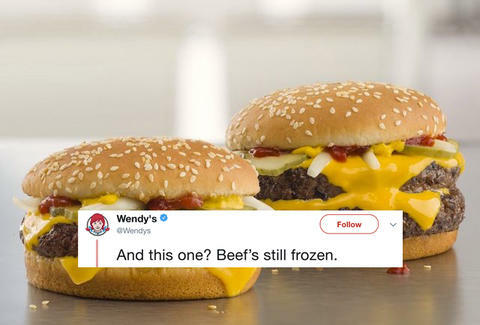 Of course, Wendy's is trying to use the McDonald's announcement as a reminder that it never freezes the meat for its burgers. In fact, it's been taking swipes at the frozen burgers served at McDonald's throughout the young year. That includes a Super Bowl commercial and accusing McDonald's of freezing the live feed during a hiccup in the Super Bowl broadcast. On McDonald's part, the change to fresh beef for Quarter Pounders has hit 3,500 locations in the US already, including restaurants in Atlanta, Memphis, Salt Lake City, Orlando, and Raleigh. Once they're out everywhere, maybe they'll offer a freebie to get customers to give the new burgers a try. Wendy's is using that philosophy to get burger lovers to download its app. You can get buy-one-get-one-free burgers and chicken sandwiches through the Wendy's app right now. Ridicule is not included, but you know where to go to get that for free.